As a marketer, SEO can seem overwhelming, but you know it’s critical for your content marketing. A lot of changes are taking place in that industry, and it can be challenging to stay up to date. 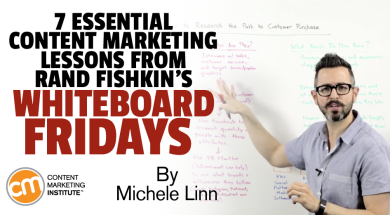 Lucky for us, we have Rand Fishkin and his popular Whiteboard Friday on Moz. If you aren’t familiar with the Whiteboard Friday series, I highly suggest you check out these gems. Not only will you learn a lot, but these are a fantastic example of how consistent, exceptional content can build an audience. Regardless of whether you are new to this series or a regular, here are my favorite Whiteboard Friday moments for content marketers. How can I create content that will rise above the noise? We can’t just say, ‘Hey, I want to be as good as the top 10 people in the search results for this particular keyword term or phrase.’ We have to say, ‘How can I create something 10 times better than what any of these folks are currently doing?’ That’s how we stand out. Luckily, Rand offers many solid ideas in How to Create 10x Content. 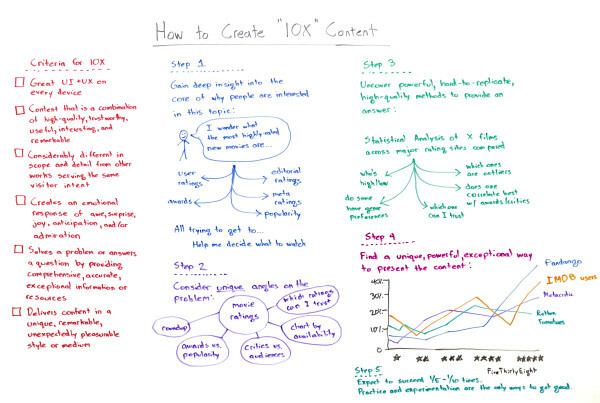 He first explains the criteria for 10x content — and how it should make the reader feel — then offers four steps to create it. Even if you cover a widely discussed topic, don’t give up hope. Find your unique way to cover it — to offer something no one else has. How do I create a metrics dashboard? What you measure is what you’re able to improve. 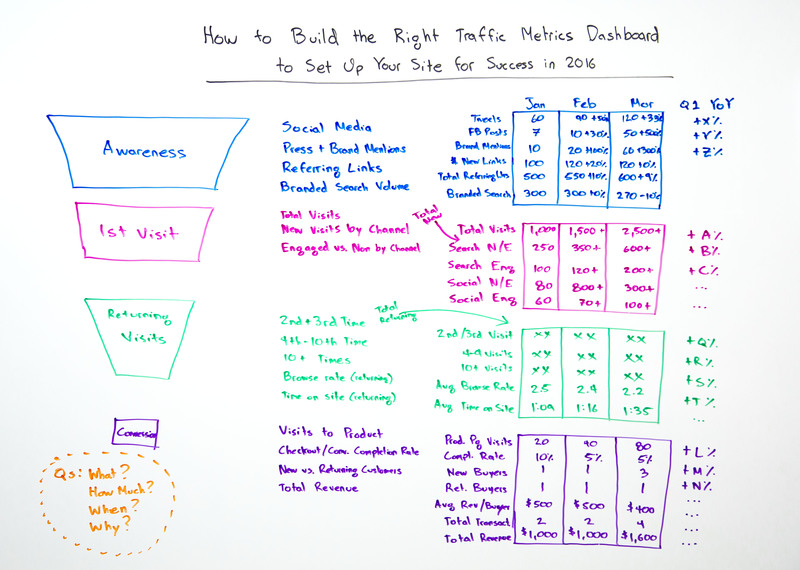 I love that quote from Rand from his Whiteboard Friday, How to Build The Right Traffic Metrics Dashboard. We all know that we should only collect data that we plan to take action on, but are we systematic about this? Or are various teams collecting different data — or even the same data? Every team can benefit from creating a metrics dashboard to get everyone on the same page and stop redundant reporting. 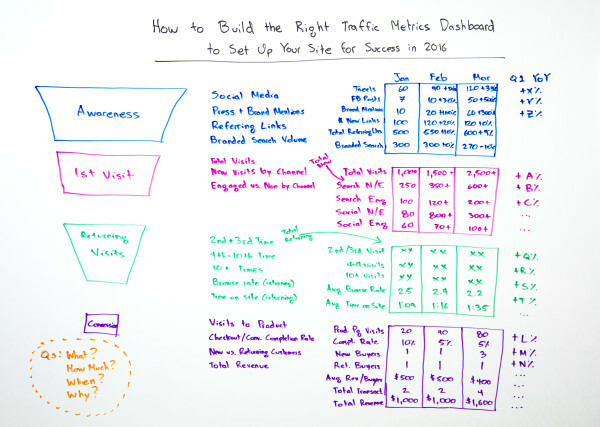 As Rand explains, this dashboard needs to be customized for your needs, but it is a great framework if you are struggling with what metrics to collect. What old-school SEO techniques should I no longer use? If you are like many marketers I know, you understand the basics of SEO and have some general practices you adhere to in an effort to appease the search engine gods. Yes, you know you should write for humans instead of search engines, but what else should you do, specifically? 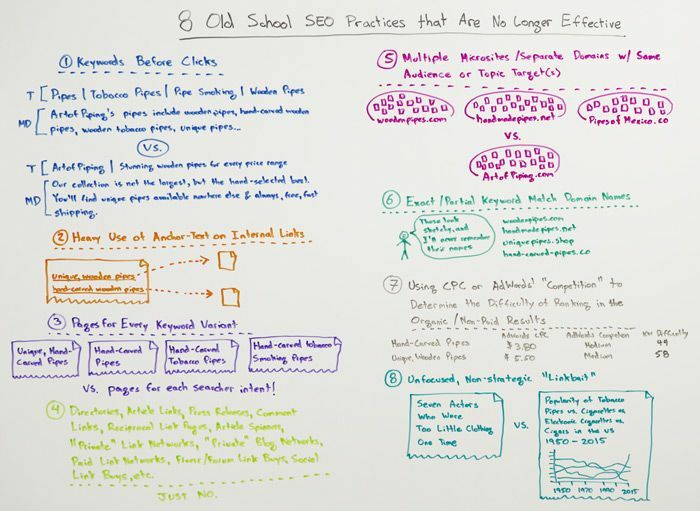 In this popular Whiteboard Friday, 8 Old School SEO Practices that Are No Longer Effective, Rand walks through some things you may still be doing that don’t serve you well. Write your meta descriptions so they appeal to readers — and draw them in — instead of stuffing the descriptions with keywords. 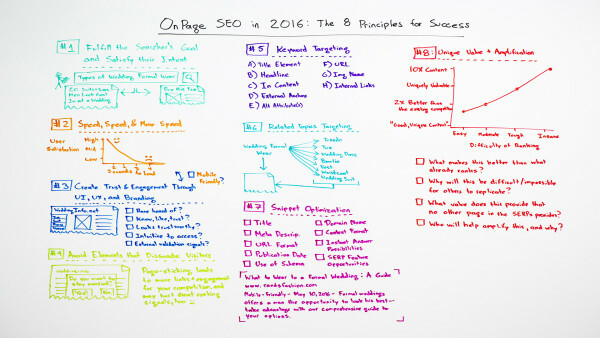 Use one page to target several related keywords. Have one robust domain that covers various, related topics instead of several that each cover one niche. This one is definitely worth a listen if you want to give your SEO practices a spring cleaning and get more from your efforts. What should you do when the wrong page ranks for a keyword? This is a challenge we have faced at CMI, and apparently it’s something that is crazy common. It goes a bit like this: You are thrilled that your site comes up in search results … but the page isn’t ideal (let’s just say it doesn’t put your best foot forward or it isn’t as relevant for that search as you would like it to be). Figure out why you are having the issue. Create a relevant page or make a relevant page even more relevant. 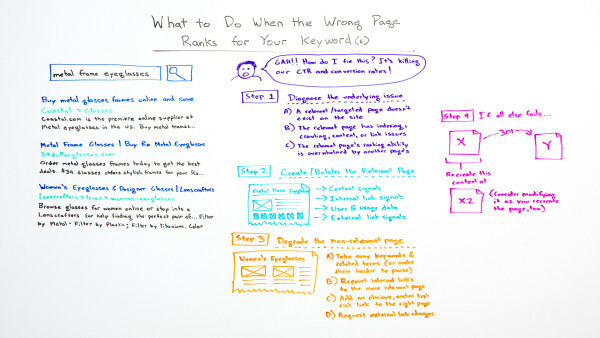 Degrade the page that is ranking and redirect internal pages to the relevant page. Consider a 301 redirect (if the page is not essential for other search terms). What should I do to optimize each of my pages? 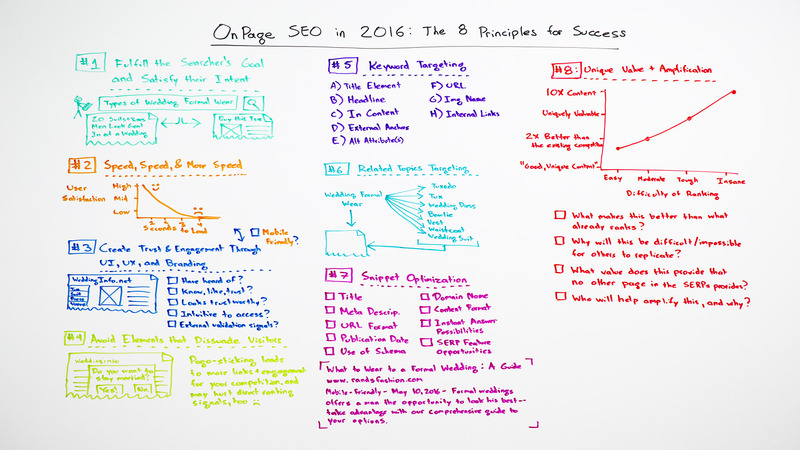 Not surprisingly, there is not a simple answer — and no simple checklist to follow — but Rand shares eight principles in this Whiteboard Friday, On-Page SEO in 2016: The 8 Principles for Success. How many internal and external links should I have? Do you want to include links to other things on your website but wonder how many you should have? Should you include just a few more links to the page to drive people deeper into your website? 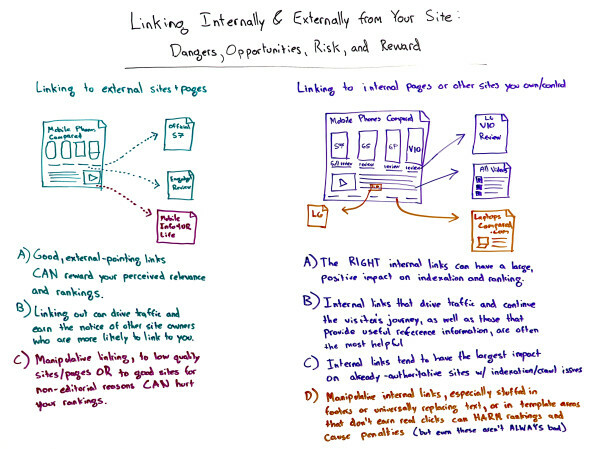 Internal links that tend to perform the best . . . tend to be the ones that drive real traffic, and they sort of continue a visitor’s journey. Should I focus on keywords or topics? This is a conversation our editorial team has had: Should we optimize for keyword or topic? 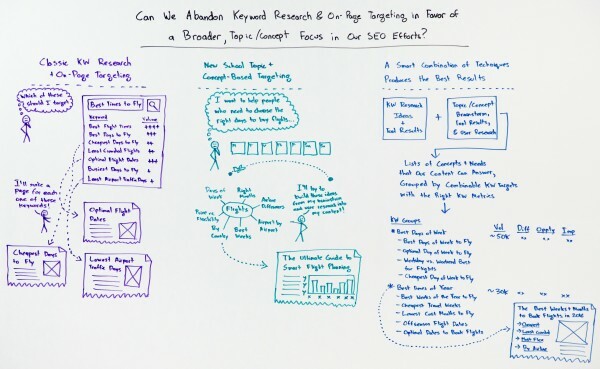 Rand handles this question in Can SEOs Stop Worrying About Keywords and Just Focus on Topics? The classic mode of thinking is to create a list of keywords and then create pages to address them. However, the issue is that similar words (think: content curation vs. content curator) would need the same information, so some people create different pages for each keyword even though the intent is the same. A newer approach is to focus on broader concepts and topics instead of the keywords. You see this all the time with the proliferation of ultimate guides that set out to answer all of the questions you may have on a topic. While there may not appear to be a downside to this — and this super-awesome piece of content may be widely shared — chances are that it won’t rank well because it covers so many topics. Rand suggests a hybrid approach that uses a combination of keywords and topics. Back over to you. What are your favorite Whiteboard Fridays? Don’t miss Rand Fishkin, the Wizard of Moz, when he shares his great insight and practical tips at Content Marketing World Sept. 6-9. Register today and use code BLOG100 to save $100.